One of my favourite painters is Edwin Landseer, who will always be associated with his Scottish paintings featuring wild landscapes and majestic deer, such as the Monarch of the Glen, pictured above, painted following a visit to the Highlands of Scotland in 1824. So inspired was he, and so taken by the wild Scottish landscape and people, that Landseer continued to visit Scotland every autumn for many years thereafter. In 1815 Landseer began studying with the history painter, Benjamin Robert Haydon, and in the following year he entered the Royal Academy Schools at the age of fourteen. Landseer had a gift for painting animals, either as animals, or as animals in human attitudes, as in his Laying down the Law, shown here. 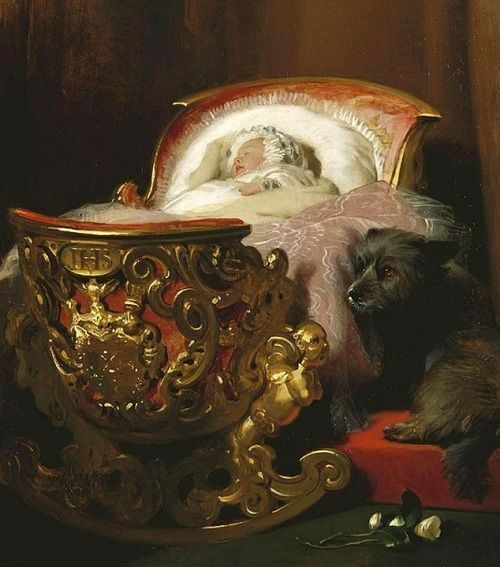 Landseer was inspired to paint it after seeing Count d’Orsay’s French poodle, Montaigne, resting on the table. At the time, Lord Lyndhurst — who had held the Seals before, and would hold them again — remarked, “What a capital Lord Chancellor!” prompting Landseer to dash off the painting. At the request of the Duke of Devonshire, whose property it became, the artist afterwards introduced his Grace’s Blenheim spaniel just above the highly-bred greyhound. The painting now hangs in the visitor’s entrance Hall at Chatsworth House, while a sketch of Montaigne that Landseer had done for the painting was part of the contents of the Blessington/D’Orsay auction held in Spring of 1849 at Gore House when the couple fled to France to avoid their creditors, a la Brummell. Another of Landseer’s famous canine portraits, and a personal favourite, is that of Eos, Prince Albert’s favourite greyhound, which he painted at the request of Queen Victoria, who gifted her husband with the painting. 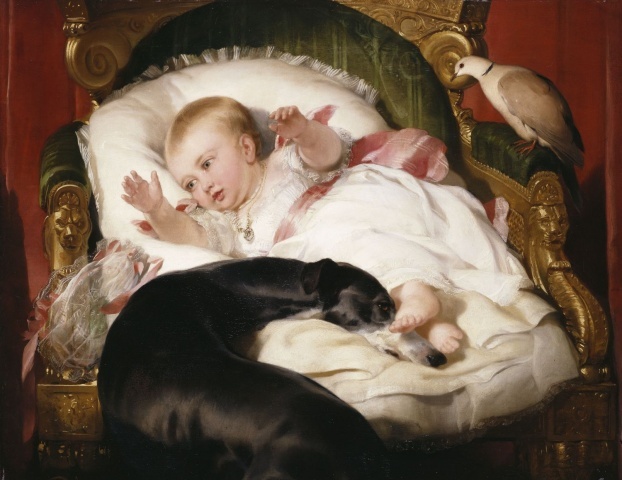 The Queen wished the Prince’s hat and gloves to be introduced into the composition, and sent them to Landseer’s studio for this purpose. However, another favorite has always been the evocative 1837 painting titled, “The Old Shepherd’s Chief Mourner,” seen below. I found a color print in a magazine years ago, cut it out, framed it and have had it on my wall ever since. It’s so poignant, so heart tugging that you can really only look at it when you’re in a good mood. Gaze upon it when you’re even quasi in the dumps and you’re a goner. The sense of pathos in this work is almost painful to behold. Beyond the pitiable dog, there is little to see in the scene – a room with a hard packed dirt floor, plaster, or daub, falling from the dingy walls, a discarded walking stick and hat and a bible. Though there are a simple wooden chair and a three-legged stool, the main piece of furniture in the scene, of course, is the coffin. With these few props – and the dog’s pose – Landseer managed to eloquently convey the life of the Old Shepherd and the sort of man the Old Shepherd must have been. Everyone who looks upon the scene will, quite naturally, form their own opinions on this. In my mind, I see the Old Shepherd as a loner, perhaps uncomfortable in the company of others. Making monthly trips to town for supplies, he spent his days in the company of his sheep and his faithful companion, his nights looking out at the distant mountains and stars or in reading his bible. Perhaps he indulged in the occasional wee dram of whisky and a pipe. However, the Old Shepherd must have possessed at least one good relative, neighbor or friend, for to me the soft woolen blanket that has been draped over the coffin and on which the dog rests his head seems too fine, and too clean, to have belonged to the Old Shepherd himself. How long had the Old Shepherd lain ill in his cottage before he had been discovered and someone had brought him food, water, a kind word and the blanket? 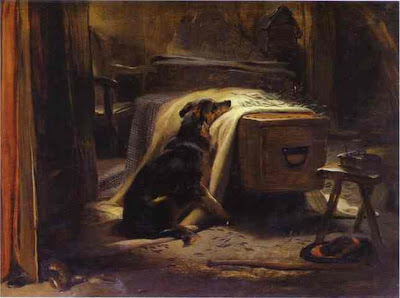 Now that the Old Shepherd is gone and it has become apparent that the dog will not leave his side, this same someone has draped the blanket on the coffin for the sorrowing dog to rest his chin upon. In my personal imaginings, this same kind someone will take the dog home with them once the Old Shepherd has been buried and the dog will be grateful, but will ever after miss the company of the one who had loved him so singularly and so well. 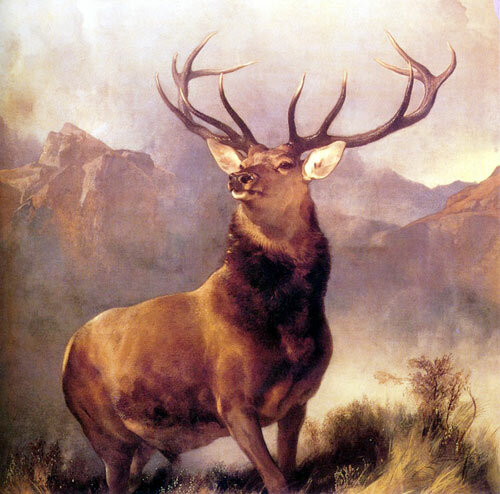 To evoke such thoughts and feelings in the viewer was one of Landseer’s greatest talents. Praise for Landseer is and was unanimous, with he and Stubbs still standing as the greatest English animal painters of all time, yet Landseer had no talent for business. It was his art patron and personal friend, Jacob Bell, who took Landseer in hand and arranged for him to put realistic prices on his paintings. Previously, Landseer had consistently undervalued his own work, a fact which benefited Bell early on as a collector. However, having purchased eighteen Landseer paintings, Bell left them all to the nation upon his death, including Dignity and Impudence, above, one of Landseer’s best known works. Another patron who benefited early on was John Sheepshanks, son of a wealthy Leeds clothier who became one of the age’s leading art collectors. He purchased the above mentioned The Old Shepherd’s Chief Mourner for a “ludicrously small” price, according to W.P. Frith. Thankfully, Sheepshanks also left his collection of art to the nation and The Old Shepherd’s Chief Mourner now hangs in the V&A for all to see. Bell and Sheepshanks had both inherited huge sums from their industrialist fathers, allowing them to buy and grow art collections by several contemporary painters. 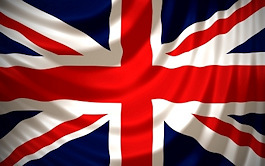 Their wealth also allowed them to socialize with the aristocracy and Landseer, by proxy, was given entree to that world early on, before his talent would no doubt have eventually opened some of the same doors. 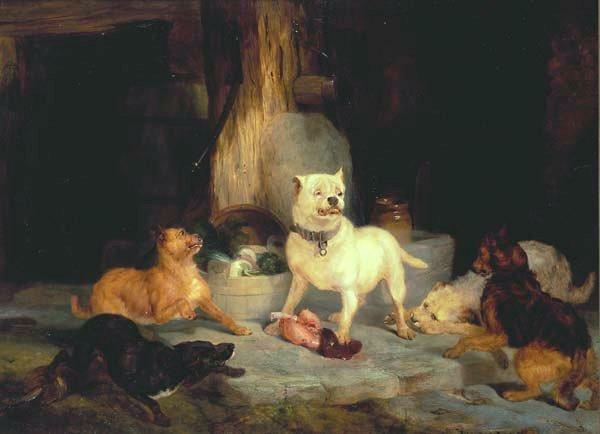 By 1835, Landseer could boast some very important people amongst his clients, including the Dukes of Aberdeen, Argyll, Atholl, Devonshire and Wellington, but life changed significantly for Landseer the next year, after he was commissioned by the Duchess of Kent to paint a portrait of Dash, her daughter, the future Queen Victoria’s, King Charles Spaniel, which pleased Victoria greatly. 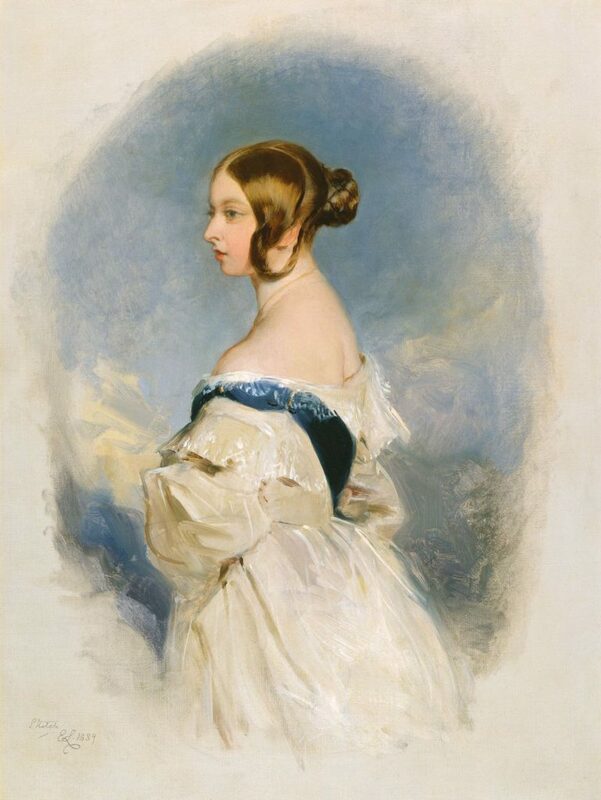 Just months afterwards, Victoria took the throne and commissioned Landseer to paint a further portrait for her. 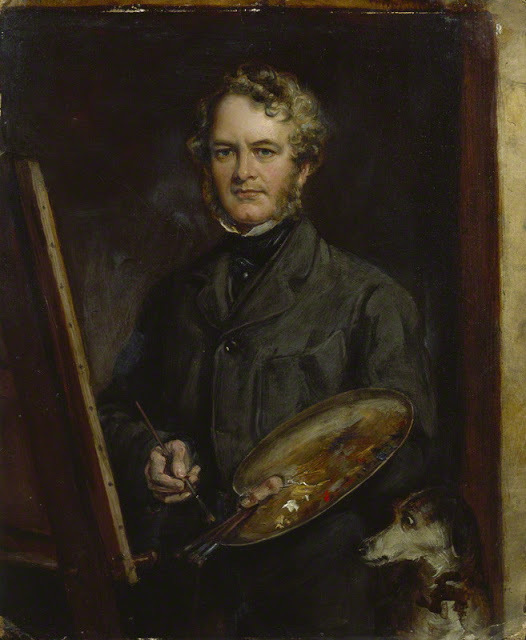 She wrote in her diary: “Saw Lord Conyngham and Edwin Landseer, who brought a beautiful little sketch which he has done this morning, of a picture he is to paint for me of Hector and Dash. He is an unassuming, pleasing and very good-looking man, with fair hair.” Landseer must, indeed, have been pleasing to the new Queen, as she would go on to commission many further paintings and portraits from him, to invite him to stay at Windsor, at Osborne and in the Highlands and remained, to the last, one of Landseer’s most loyal patrons and his friend. In addition to acting as friend to both Queen Victoria and Prince Albert, Landseer also taught them both to draw and, further, to engrave. His elder brother, Tom, was a well known engraver, as was their father, and with Tom’s help, and that of Henry Graves, the Royal couple were taught to engrave and press prints of their own making on a press set up in Buckingham Palace for just this purpose. Landseer will always be thought of as a masterly painter of dogs, stags and, much later, lions, but it is by his dogs that he is most remembered. His own dog, Brutus, was a model for many of his early dog portraits, followed by Lassie, a Scottish sheepdog and a pedigreed pooch called Breechin. Landseer owned dogs, and gained fame by painting dogs, which led people to believe that he had some special, uncanny connection to dogs, which prompted friends, and even strangers, to write to him for advice concerning their own problem pooches. 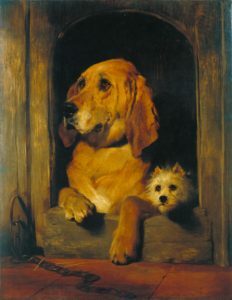 Eventually, Landseer’s connection to dogs began to work against him, as critics began to complain that his later canine portraits were overly coy and/or sentimental. Landseer went from painting studies like The Old Shepherd’s Chief Mourner or even Eos, to endowing the dogs he put on canvas with overtly human expressions or attitudes. In Laying Down the Law, mentioned above, Landseer inserted the Duke of Devonshire’s spaniel into the finished picture at the Duke’s request. Some say that the inclusion ruined the symmetry of the composition. Regardless, such was the fate of an artist whose chief source of income were the commissions he received from wealthy and aristocratic clients who clamored to have their pets memorialized by the great man himself. Landseer continued to paint other subjects and to show them at the Royal Academy, but this may be where the rot began to seep in – more and more, Landseer began to doubt his own abilities, he became less sure of himself and often gave in to bouts of melancholy and drink. More frequently than not, he began to put off beginning a commissioned work and to miss promised deadlines, even though he was renowned for being able to deliver fully realized paintings in record time. The head of Odin took him two hours, to complete and Landseer tossed off Rabbits in three quarters of an hour. Queen Victoria had offered Landseer a knighthood in 1842, which he humbly refused to accept until 1850. 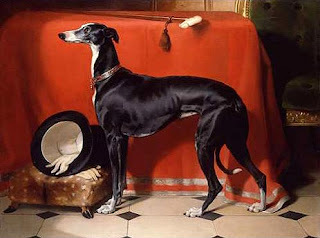 That same year, he was still taking canine commissions from the Queen and it was also the first year that he was invited to stay at Balmoral and to bring with him “his drawing materials.” In this same year, Landseer’s contribution to the Royal Academy show as his Dialogue at Waterloo, commissioned by his patron Robert Vernon for the princely sum of three thousand pounds. The outsized picture (six feet by 12 feet in size) was produced by Landseer in response to Vernon’s request for a Waterloo painting. Vernon had made much of his fortune by supplying horses to the military and he was also an admirer of the Duke of Wellington. However, Landseer knew full well that his strengths as an artist did not translate to full blown battle scenes. Instead, he portrayed the elderly Wellington revisiting the field at Waterloo on horseback, accompanied by his daughter-in-law, the Marchioness of Douro – a nice sentiment, however the scene never actually took place outside of Landseer’s creative imagination. Regardless, the subsequent engraving sold extremely well. Increasingly, Landseer suffered bouts of melancholia, causing him to isolate himself within his home in St. John’s Wood and to turn to alcohol and drugs for relief. Despite this, Landseer enjoyed popularity throughout the Victorian era and, although he had no previous experience as a sculptor, in 1859 Landseer was commissioned by the government to make the four huge bronze lions for the base of Nelson’s Column in Trafalgar Square, London. It took him eight years to complete the work. Lions were not a new animal for Landseer – he had been given the carcass of a Regent’s Park zoo lion by it’s keeper after it had died of old age in 1848. After 1859, Landseer managed to acquire another elderly lion, still living, which he kept in his garden. He also made visits to the Regent’s Park zoo to study their still living lions. Landseer completed other works over the course of the eight years, in between bouts of melancholy, but once again, he stalled for time on the most important work in progress. Finally, the clay models were completed and were cast in bronze by Baron Marochetti, whose experience to that point had largely been confined to casting large equestrian statues for public spaces. 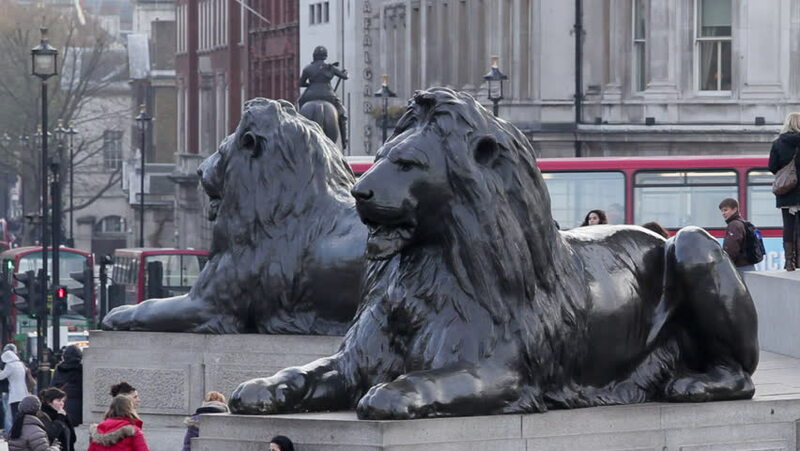 The lions were put in place and unveiled in Trafalgar Square on 25 January, 1867. 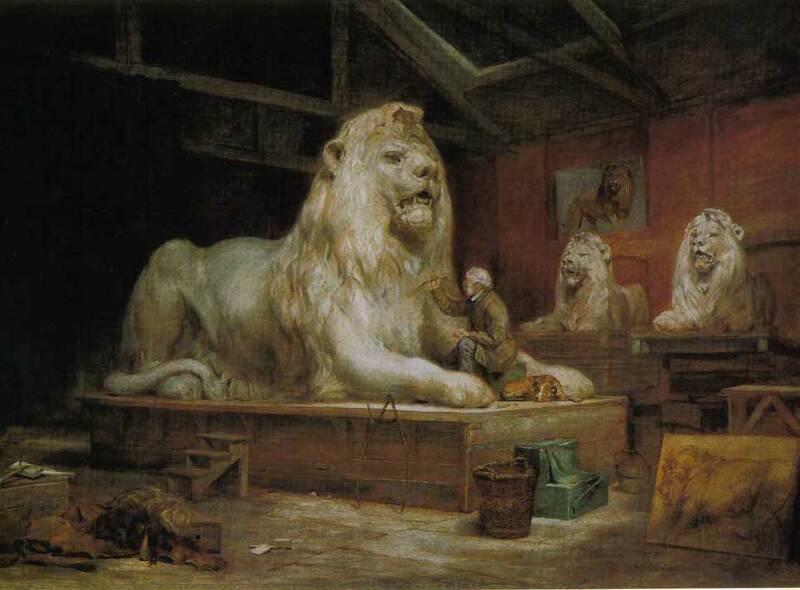 To this day, rumours persist that Landseer’s lions are not anatomically correct and that, unable to secure an actual lion as model, Landseer instead used a common variety house cat as his study. The facts prove this to be untrue. In actual fact, though Landseer had models to hand, he was most likely unable to bestir himself to make use of them. As with his Dialogue at Waterloo, he solved the problem in the end by using a sort of “bait and switch” tactic – the Art-Journal got right to the heart of the matter: “it appears that one body only has been modelled, while two heads were made, each of which served for two bodies. Thus the same body was cast in bronze four times, and the heads twice each.” Another reason for the persistence of the cat rumour can be traced back to early complaints that resting lions do not place their paws flat on the ground, as house cats do, but instead have them angled inwards. Despite The Illustrated London News having published photographs showing zoo lions with their paws in both positions, the rumours refuse to die. In 1872, Landseer’s health had broken down to the point where his family had him certified as insane and he died the following year. The Times wrote: ‘Sir Edwin has been long known to be in a most precarious state of health but the news will not the less shock and grieve the worlds of both art and Society in which he was an equal favourite.’ Landseer was buried with full honours in St Paul’s Cathedral and his lions guarding Nelson’s Column were hung with black wreaths. Love Landseer, saw several of his paintings when I went ot see the Victoria & Albert exhibiti at the Queen's Gallery last week. We are so looking forward to this Exhibition! Was it as wonderful as we are expecting? 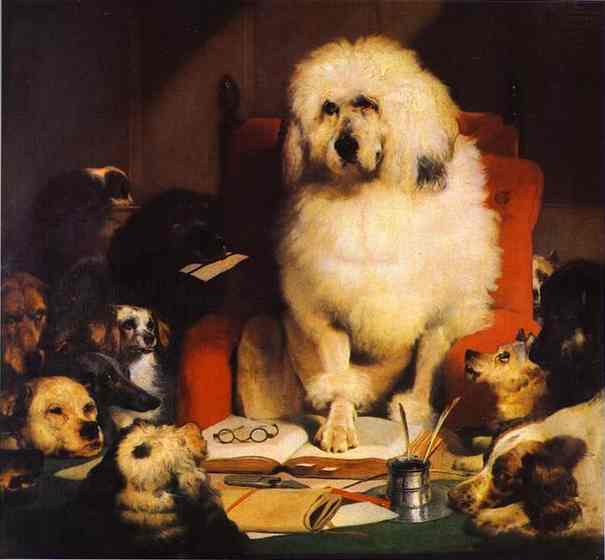 Love Landseer as many of his paintings include dogs! The Old Shepherd's Chief Mourner is one of my favorite paintings ever. Kristine, it was wonderful. I even bought the guide to the exhibition. Look out for the ivory chair from India, and the lovely watercolors that depict the Great Exhibition. 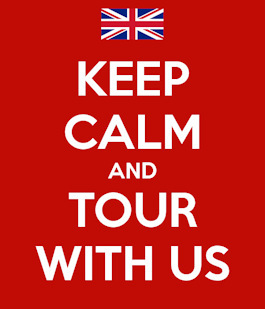 The great thing is that if you have your ticket validated, you can come back again during the next year. 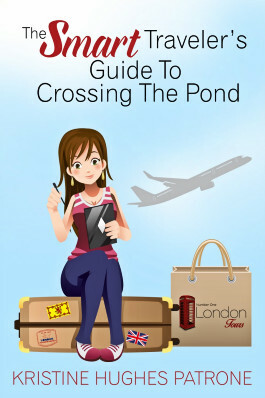 Ooooh, the exhibition guide! Will definitely pick one up. Thanks for your input – I can't wait to see it all! To have all of these pieces that one has read about in one place is a fantastic opportunity. A great post on this talented artist. I’ll be sharing it on FB tomorrow! Thanks.